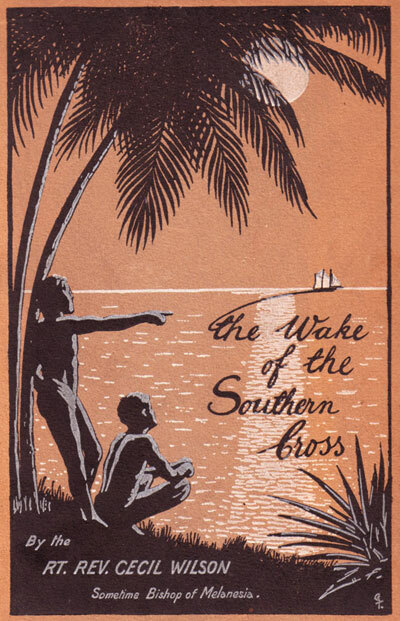 Why I left England--Difficulty in finding a bishop--Bishop John Selwyn--Contrary advice--Archbishop Benson--Kent cricket--S.S. Austral--Consecration--Birthplace of the Melanesian Mission--A Maori address of welcome. Our Mission ship--The Island--Mission Headquarters--Norfolk Islanders--Bounty mutineers--The Island as a penal settlement--Old Norfolker chaplain--Primitive government--Patriarchal simplicity--Difficulties of too close relationship--Pleasant lot of a Norfolk prisoner--The Mission station--The Island's fertility--The Vanua--Patte-son Memorial Chapel--A boy's choice of future work--Cook-sets and routine--Figas--Phylacteries at a street corner--Miracles no stumbling-block--Weddings--A letter to the King--Certain reflections upon Og--A great kindness--Pacific cable. Northwards--Walpole Island--Vila, capital of New Hebrides--Nine dialects--Raga--Chief's death with no fighting to follow--Low status--Rough paths--Peace stones--A Chief's burial--A green football--Dancing-grounds--George's step in Sukwe--Innocent enjoyment--Capital punishment--Right and Wrong--A reason for refusing my meat--Marriage by capture--Customs giving way--The end of a magic stone--Not dirty enough--My peaceful life--Opa-Tagaro--A ghost pig--Disturbed conditions--Trader's experiences--Charles Godden--His death--Maewo--An "earthquake"--Only pigs to think of--Honesty--Mat money--Blind Jack--Conditions under Condominium. Eight islands--Queensland Kanaka trade--"Steal-steal ships"--Mota--Two sides of the house--Swimming from husbands--A very long swim-Cooking in the gamal--Qat and Qasavara--Origin of bald heads--Until the sun sets--The Un worm--Wily fishermen--Canoe-craft--Rough trip to Merelava--Sukioe from missionary's point of view--Its grip on Mota--A Sukwe function--The men in the sky--Tamate Societies--As Dr. Rivers saw Sukwe--Burden of debt--A debate--Motalava--Holy garments--Nopitu--Simon and Lucy--Santa Maria--Contrasts--Rowa--Shell-money--Qasvar's memories of Patteson--Giants of old days--Rowa Church--Sharks--Turtle for supper--Torres Islands--Bone-tipped arrows--Use for sweet herbs--Eating down. Our first landing--Our second--Hunger--Third landing--Tremendous reception--Uses, of a king's son--Fourth landing--Teachers ill--Spirits unfavourable--School closed--Ellice Islander set adrift--Fifth visit--Welcomed back and school reopened--Edgar and Ellison--Sixth visit--Plenty of food--Seventh visit--Willing to give us boys-Eighth visit: boys return--Maori and Durrad--Stealing--Unpleasant alternative to marriage--Ninth visit--Afraid of us--A sailor's cold--Tenth visit; trust in our promise--Danger from a ship's whistle--Eleventh visit; Ellison's marriage. Vanikolo--La Perouse--Santa Cruz--Spaniards--Difficulties--First footings--Just in time--Language and nose-rings--Ghost-houses--Old Natei--Swimming to school--Shark-fishing--Graciosa Bay--First motives for friendship--Driven from Neun-dang--Te Motu--Disposal of a waster--Namu--A burial--Red paint--Nights in mandai--Looms and feather-money--Twine-makers--Cat's cradle--Making tally equal--Attacks on traders--Reef Islands--Polynesian strain--Nukapu--Native account of Patteson's death--Matema--Life in the Reefs--Pileni--Ghost stocks--A braggart's end--Nifololi--Attack expected--Fenualoa--A beard--A shell razor--A sea idyll--Graveyard--Longing for schools--Inducement to rise early--Sacrifices--"Sin"--Spirits--Evolution of human ghost. Discovery by Spaniards--Larger islands--Sir John Thurston--Ugi--A bright spot--Taki--The Queen's Letter--Infanticide--Tattooing--A dog's life--A hut in a swamp--Faiato's dilemma--"Sick of a fever"--Drum signals--Death feasts--Disposal of the dead--Their souls--The Snake Spirit--Snake worship--Human origins--"Captain Marau"--Trial by ordeal--Heuru--Money out for heads--Consecrating a new church--Native imperturbability--Valuable workers. 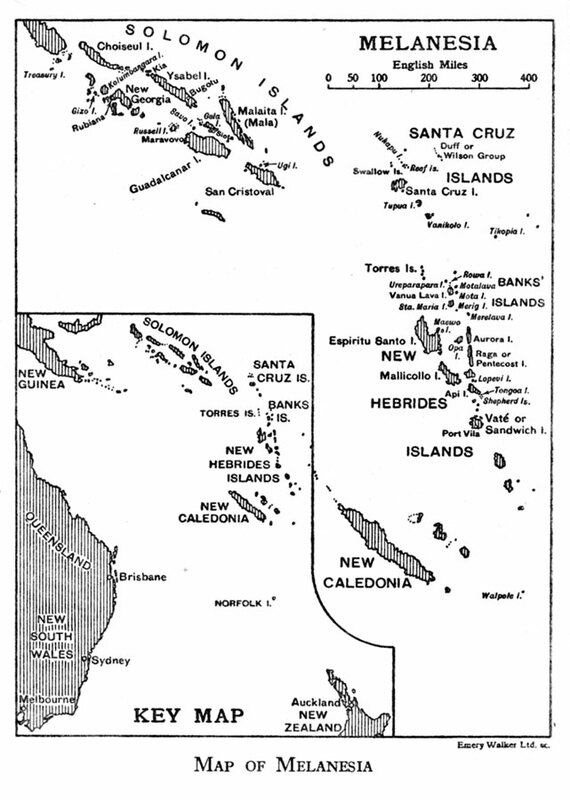 Contrast to New Hebrides--Charles Sapibuana--Tindalo--H.M.S. Sandfly--One language--Food--Five tribes--Wedding--Schoolboy recovered--Kanaka trade--H.M.S. Pylades--A cricket match--Price of wives--Native parliament--Purchase of Bungana Island--Release from vows--The rock that split--The new Southern Cross--A stable population--Ututha passage--Siota--Mission Headquarters--Seat of Government--Trading centre. The wildest island--The Rev. John Still--Cannibalism and murder--A state of siege--Contrast in appearance between Christians and heathen--Watching for a ghostly light--Artificial islets--Crowded but safe--Qaisulia, a very big chief--Porpoise teeth and porpoise catching--Danger spots, Gnore Fou and Fiu--Hopkins advised to leave Gnore Fou--Palisades and stockades--The . turn of the tide--Christianity brings peace--Singalia has an offer--A fortress becomes a town--Value of Kanaka Christians. George Basilei--A new St. Patrick--Ghosts in books--Austrian man-o'-war--First school broken up--A raid--Sulukavu--The vele charm--Beginning of Maravovo--Defeat of Sulukavu--An Adam's apple--Megapods--Jfefa girls--A human sacrifice--Coco-nut plantation, hospital, printing press--Savo--Sharks of Savo--Building of Savo--Courage of their convictions--Result of chance visit--Self-styled policeman--A good clean-up--Kosi's downfall--Two traders--Torolala comes in--What became of the sharks? Bugotu--Discovery by Galego--Thousand Ships Bay--Reefs and shoals--Soga, Bugotu chief--His power and character--Soga's village--Handshaking--Head-hunters--Tree houses--Winchesters--Captain Davies--Last raid on Bugotu--Teaching which gives peace--Alternative to fighting--A denuded coast--Pearlers--A not uncommon fate--New names for canoes--Choiseul--Too late--Shortlands Group--Shrines--Skulls to worship--Trophies--Danger for small villages--New Georgia--Rubiana Lagoon--A withdrawal--Dr. Welchman--Crocodiles--Conclusion--Comity of Missions--Overlapping--Bishop Montgomery--Growth of Missions in Pacific--The Bishop's routine--Missionaries' holidays in England--Two kingdoms--A missionary's gains.